For example, Beyond staff found that the young people hanging out at the void deck of a rental block were keen on floorball and roped in a floorball club to teach them the sport. Beyond also organised floorball tournaments and invited their parents and neighbours to cheer the youngsters on. The TGIFloorball program for our kids in the neighborhood was mentioned briefly in the Straits Times last week. Being able to afford to play a sport like floorball which requires expensive equipment and a specialised venue is a luxury. So we started smol by partnering our Orcas’ coach Sonia Teo who has years of experience coaching kids. She bought some junior floorball sticks online and we ordered a pair of portable goalposts from Jokasports. The group grew in attendance and they showed us their commitment by attending training punctually and with tons of energy. Soon enough, sustaining the program was becoming difficult for us because of competing stakeholder interests and issues like securing a proper long-term venue. But the team pressed on and soon, we saw the light. We now have a proper venue thanks to Kebun Baru CC and we can organise floorball events with the support of Kebun Baru CSC. Along the way, we have also met many supportive parents who volunteered to settle the small things like arranging snacks for the sessions. Importantly, all that we have achieved so far would not have been possible without our coach Sonia Teo and my awesome KBFF teammates supporting the kids at events and training sessions. Thank you for the shared belief and for doing this with one united team spirit. Tonight was the first 3v3 dedicated floorball event just for kids at the new Kebun Baru CC. Special thanks to Youth Floorball Academy and Floorball Nation for their support as well. We have had a flurry of successful events this month which would not have been possible without our wonderful teammates who came together tonight to be guardians, cheerleaders, coaches and bodyguards for the kids. 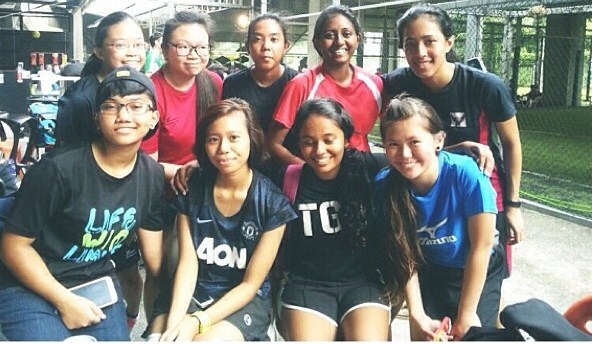 Our first game against Zyrus FC marked the commencement of the Division 3 Singapore Floorball League. Although we got off on the wrong foot, it pushed us to train even harder for our next match. Our Man of the Match (MOTM) was Amielle Alimusa (#01), who was our keeper of the day with many nice saves to boot. Amielle has been with KBFF since she was 15! Determined to bounce back after our loss last week, we fought hard in our game against NTU Storm. Our lack of intensity and and focus cost us our third game against Katana FC. A third period fightback was not enough. With the seniors putting in a good shift, this game was a timely wake up call for the young players to use the holiday break to train much harder. Our sessions will resume in January. Contact us to get onto our mailing list. Since we had no game this weekend, we had a kick about at Offside at Whitley road under the flyover. Let’s just say…after two hours of soccer, some of us should stick to floorball :p Nevertheless, it was really fun sweating it out and using our feet instead of sticks. Author funfloorballPosted on November 24, 2013 November 24, 2013 Categories Team StuffTags futsal, KBFF, street soccerLeave a comment on Soccer Sunday!